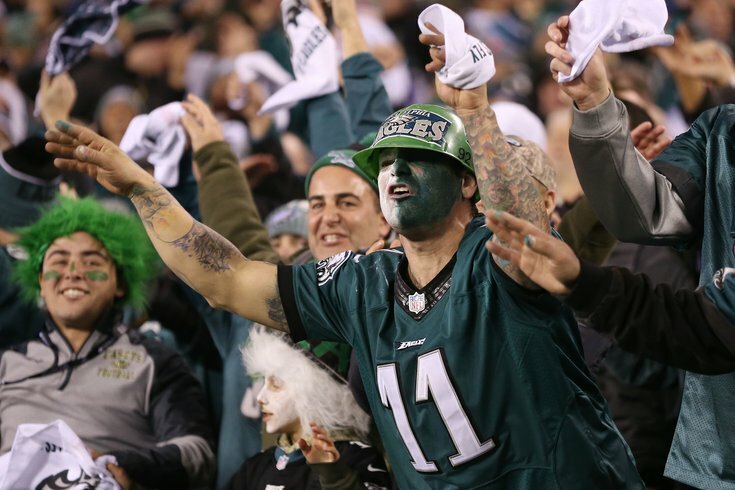 Philadelphia Eagles fans cheer from the stands in the third quarter during the NFC Championship Game. One of the great things about going to college in Miami was that the majority of my friends were from a completely different part of the country – Florida (obviously), California, Texas, Ohio, New England, the Carolinas, and even Hawaii. Of course, there were plenty from the Mid-Atlantic, like New York, New Jersey and Pennsylvania, but by and large, they were different people from different cities with totally different life experiences ... and totally different rooting interests when it came to professional sports. At one point, my house featured an Eagles fan, a Giants fan and a Patriots fan – luckily I never had to live with any Jets fans, because they're just the worst – and needless to say, there was plenty of trash talking every Sunday that fall. It also just so happened to be the same season the Giants beats the undefeated Patriots in the Super Bowl – and the only time I ever remember rooting for the Giants. The Eagles (8-8) finished in last place in the NFC East that year (2007-08). They lost twice to New York during the regular season and once to New England. Still, there was no question which team I was pulling for that February. I was tired of seeing Patriots fans, who had gotten to celebrate three Super Bowl wins in the previous six years, including one over the Eagles; I didn't really care who they were playing. It also didn't help that the Patriots fan was considerably more confident in his team's chances – and, like most Pats fans, much more likely to let you know about it. Looking back, I can't say I'd be much different if my team had just finished the first 16-0 regular season in NFL history and had a future hall-of-famer at quarterback – not to mention those three rings he'd already won. But that confidence-bordering-on-cockiness wasn't unique to that season. Even at his wedding last year, which took place on the final weekend of the NFL regular season, he (and the large contingent of Pats fans in town for the festivities) exuded as much confidence as ever. After all, this is the guy who corrected me for referring to Brady simply as a hall-of-fame quarterback, rather than the G.O.A.T. (and he actually might have a point there). In the decade-plus I've known him, that confidence has never wavered ... until now. While texting back and forth about the upcoming rematch of the 2005 Super Bowl, which took place less than a year before we met, he said something that I never in a million years saw coming. "Honestly though," he wrote, "after last year against the Falcons, [the Patriots] are due to lose. "And the Eagles are overdue to win one. Plus Philly has some former Pats on the team that are leaders and know how to win (Long and Blount)." Maybe he's just being cautiously optimistic rather than recklessly optimistic like he was back in 2008. Or maybe he's just afraid to poke the bear (in this case, Eagles fans), like Boston Globe columnists Dan Shaughnessy. In a recent column, Shaughnessy spoke with former Phillies and Red Sox manager Terry Francona about the differences between the two fan bases. He also made it a point to say that he's not going to rip Eagles fans ... just a few paragraphs after listing the same tired, decades-old, not-entirely-true Philly sports cliches that anger local fans more than almost anything else. No doubt you’ve heard about the notorious Philadelphia fans. They pelted Santa Claus with snowballs. They cheer when a guy on the opposing team gets carted off on a stretcher. City workers routinely smear Crisco on lampposts to discourage fans from climbing them when a Philadelphia team threatens to win a championship. Johnny Most called Philadelphia "the city of brotherly hate." Philly fans are more angry and profane than fans anywhere else. The fact that Eagles supporters are starved for a championship only makes them more menacing and formidable. In this space, I routinely ridicule fans and cities of upcoming Patriot opponents, mocking the pitiful goobers from the yahoo towns, harpooning a chorus line of tomato can fans from tomato can cities. If Shaughnessy was worried about facing the wrath of Eagles fans, perhaps he should have left out the part about snowballs and cheering injured players. That's like poking the bear and then playing dead once you get its attention. Everyone knows that'll get you killed. Instead, try standing tall and screaming as loud as you can, like my old roommate; it worked for him. And, if worst comes to worst, just flash those Super Bowl rings as a distraction.